If you are looking for a boundary fence or decorative accent, a brick wall may entail more expense and effort than is necessary. However, for retaining walls, security fences and noise dampening, brick walls outperform simple fences. Building a brick wall takes a lot of time and a fair amount of elbow grease, but the result is a durable landmark that can last for generations. Bricks are made of fired clay, and are usually rectangular in shape and red in color. You can buy brand-new bricks, used bricks and even new bricks that have been treated to look old. Avoid used bricks that show excessive wear, because they may have been weakened and will be prone to cracking and deterioration. When you buy bricks, be sure that delivery is included in the price. Invest in a hand brick mover, a device that pinches 10 bricks together and allows you to move them with one hand. This will save you a great deal of labor. Mortar for building with bricks can be purchased in bags that only need to have water added to them to be ready to use. Read the instructions on the bag to determine how many bags of mortar you will need for the number of bricks you are using. The joints between bricks should be about 3/8-inch thick. Mortar should be mixed to a consistency that is roughly equivalent to pudding. Store bags of mortar away from water and moisture, especially if they will be stored for a long time. Mix only as much mortar as you will be using within an hour or two. If you are building a large brick wall and want to save money, you can buy the ingredients for mortar and mix it yourself. This is less expensive, but takes more work to mix the ingredients together. Mortar is made of cement, sand and lime. You can buy cement and lime in bags, and sand either in bags or in bulk, delivered by a truck. 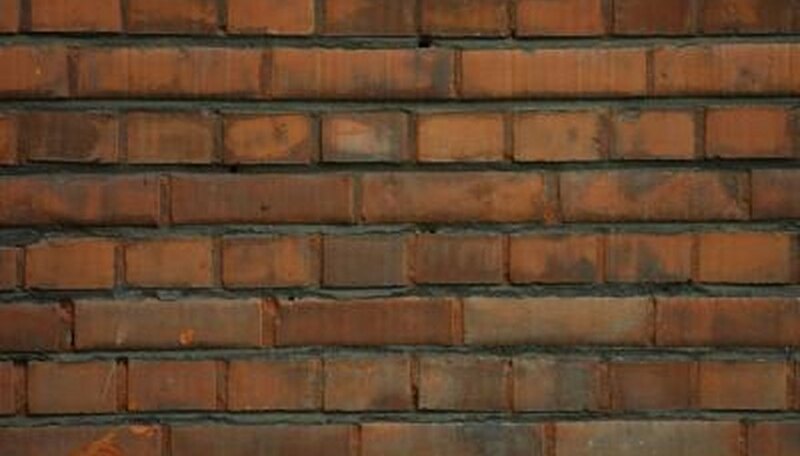 A mixture that is roughly one part cement, one part lime and six parts sand will give you mortar that is appropriate for bonding bricks. When water is added to mortar, it begins the chemical process that causes mortar to bond together. The water should be clean, with no dirt or grit in it, and roughly room temperature. Soaking the bricks in water before you build with them will cause the mortar to dry more slowly, making it stronger. Having a hose on the work site with a nozzle that can be turned on and off will save you the time and effort required to haul water from somewhere else.